The most important point to make about today is that the sky was a very strange colour this morning. I have a distant memory, from before we crossed the border into Scotland, that this colour may be referred to as blue; don’t quote me though, ‘cos I haven’t seen it this side of Hadrian’s wall. I really wasn’t expecting to awake to this colour because the rain had been on and off most of the night. It was, of course, a delightful surprise. We are here for Francine’s niece’s wedding. Since Guillaume has some carrying capacity, we had brought with us Francine’s mother’s wedding outfit (she flew up courtesy of easyJet) to save her luggage travails and we needed to delivery it in time for tomorrow’s festivities. We will, of course, have to return with it after said festivities. We’ve also won the addition of her suitcase to go with it. Good ol’ Guillaume! Duty performed, we trotted off into South Queensferry, where tomorrow’s wedding will be, to get the lie of the land. 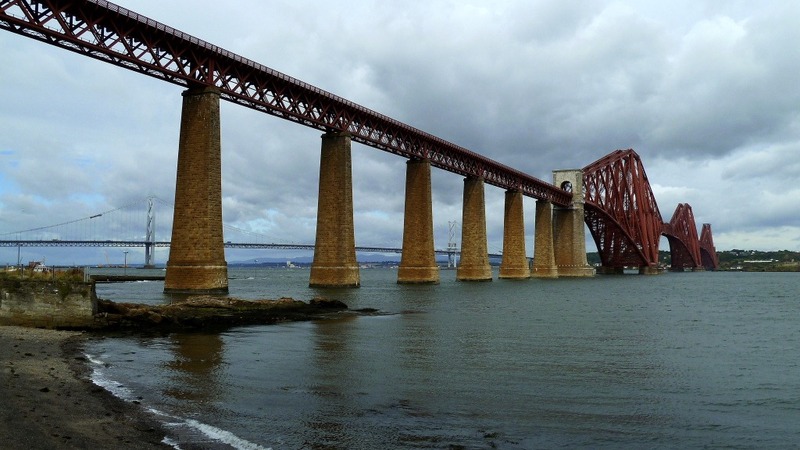 South Queensferry lies on the south side of the Firth of Forth where the two Forth bridges cross; one road, one rail. South Queensferry is so-named because, in the 11th century, the queen was ferried across the firth here. Unsurprisingly, there is a North Queensferry on t’other side. As is customary for tourists, Francine used snappy to snap the bridges. The much more interesting design to my mind is that of the rail bridge whose colour resembles the Golden Gate bridge in San Francisco, being a dull orange-red. The road bridge, on the other hand, clearly more modern, may physically resemble the Golden Gate bridge but is a rather uninspiring shade of light grey. Maybe this was done precisely to make it look different from the GG? Personally, I’d like to see them colour coordinated – and I don’t mean dull grey. Our eye was taken by a restaurant, with good views of the firth and the more interesting rail bridge, advertising “fresh mussels every day”. 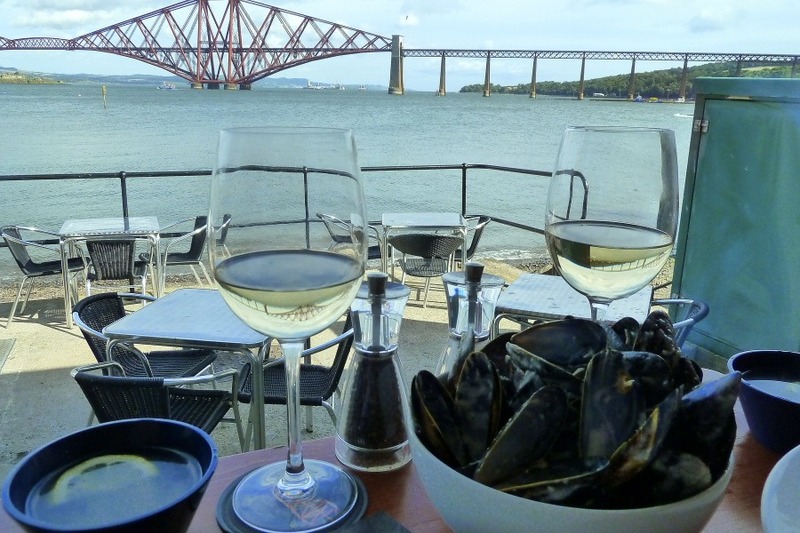 As some form of recompense for the weather we’ve had to endure, we decided to treat ourselves to another Scottish version of moules marinières washed down by a large glass of viognier. They were not quite as stunning as those in Oban but were still so good that we ate them too fast for the camera to capture them. Scottish rope-grown mussels rule, OK? The rain began again so we headed for some shops in search of tonight’s dinner. We didn’t need much after those excellent mussels. Some simply grilled tuna with a spinach, watercress and rocket salad would suffice.